A vampire owing child support . . . A law student stranded in a war-torn fantasy world . . . A trigger-happy collections agent who repossesses unpaid gadgetry . . . . . .and these are the good guys. Why should it be natural to read tales of valor, carried out by heroes who are brave, noble, or even good? Why can't the villain save the day once in a while? Or maybe the damsel in distress? Or perhaps a disinterested third party? 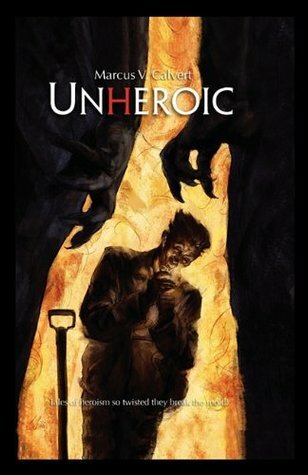 Within this collection are thirty-six dark little stories wrapped around the odd theme of "unheroic" individuals making a difference. This twisted, eclectic mix of sci-fi, fantasy, and horror tales will leave you looking at the real world through different eyes. Should the hero's journey only be reserved for the pure of heart? You be the judge. You be the judge...famous last words? Nah..nothing quite that dramatic. I met the author at an indie comic convention a couple of weeks ago and picked up this book for some hotel reading. Bonus for me, dinner plans came up so I didn't get a chance to read it at the hotel. Next bonus for me? I did get some extra reading time over the weekend and had this on hand. Let's start with the good... the stories are enjoyable and easy to read. In fact, this is one of those books that you intend to sit down and a few minutes later, you find yourself picking it back up again. The bad - The stories read more as if they're prequels to full length pieces. For someone who likes some closure to their stories, this can become very frustrating. Also, while it's nice to be able to envision as scene in your head, there is such a thing as too much description and this author tends to cozy up to that line quite a bit. He doesn't stop over, but he gets close. The Summary - I know I listed more bad then good, but at the end of the day, I would happily recommend this book to anyone who loves SciFi, fantasy, and just a great quick and easy read. My bad only out weighs the good because I wanted more from each and every story. With any lucky, the author will decide to expand on the stories and create at least novellas for each of them. With even more luck, he'll also decide to let me review his other works so I can let you know how they stack up against this one.